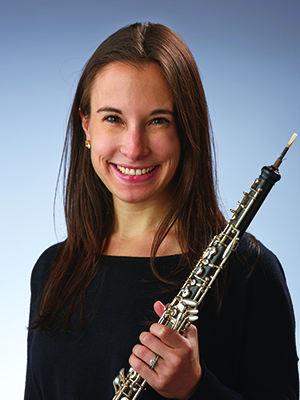 Jennifer Christen, a Buffalo, NY native is the Principal Oboist of the Indianapolis Symphony Orchestra. She has performed as Guest Principal Oboe with the Pittsburgh, Detroit, Baltimore and Milwaukee Symphony Orchestras and as Guest English Horn with the Atlanta Symphony. Ms. Christen studied at the Juilliard School with John Mack, Nathan Hughes and Elaine Douvas. Before her time in Indianapolis, Ms. Christen spent a year in Miami Beach with the New World Symphony under Music Director Michael Tilson Thomas. She has also spent several summers with the Verbier Festival Orchestra in Switzerland, where she met her husband. As a teacher, Ms. Christen has had the pleasure of working with students at the Verbier Music Camp, Indiana University Summer Music Clinic, Indiana University Med Orchestra and with the students of the New World Symphony in Indianapolis. She enjoys traveling, good coffee, exploring local food, and running. She has an identical twin sister who plays the flute.